I recently won a contest called the Great YA Bake Sale. One of the prizes was a recipe binder with hand-written recipes from 15 young adult authors! This was the perfect prize, as it combined two of my favorite things: reading and cooking! 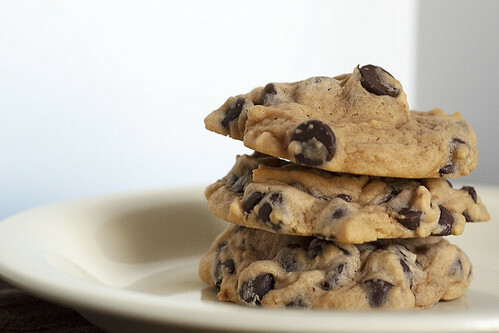 When I started browsing through these recipes, one that immediately caught my eye was this recipe for Butterscotch Chocolate Chip Cookies. There’s just something about butterscotch that reminds me of autumn and I thought this would be a great addition to the traditional chocolate chip cookie. And it was! These cookies are really chewy and moist. Mix flour and baking soda. Set aside. In a large mixing bowl, cream together butter, brown sugar and white sugar. Beat in the instant pudding mix. Then, mix in the eggs and vanilla. Blend the flour mixture into the wet ingredients. Stir in the chocolate chips. Drop cookies by the spoonfuls onto cookie sheets lined with parchment paper or a silpat. Bake for 10-12 minutes, until edges are golden brown. Let cool on cookie sheets for a few minutes until firm, then transfer to wire rack to cool completely. PS – I read a recent discussion on the cooking message board I read about blog pet peeves. Apparently, a common one is the step-by-step recipe photos. So, I thought I’d try a post without them. I must say, it was a lot easier to cook without having to grab my camera every five minutes. But I wonder if the post is lacking now that there’s just a few photos. 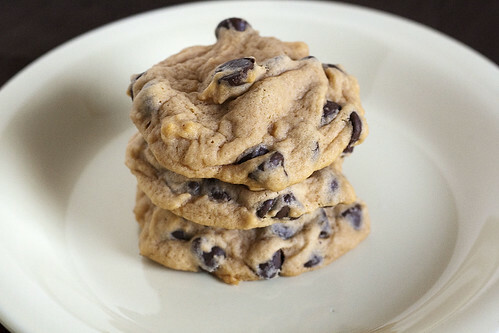 Chewy and moist Butterscotch Chocolate Chip Cookies are the perfect treat!